Log homes have been around for a very long time. There are log homes still standing which date back over 800 years! Living in a log home invokes a sense of calmness, peace and solitude that helps us escape—if only for a few moments. Because trees are renewable, log homes start green. Other building materials which require significant processing can be harmful to the environment. On top of that, they’re significantly easier to build and require less building material than a conventional home. Think about it: when you build a log home, the logs act as your exterior walls, interior walls, and insulation all-in-one. Energy efficiency is important to consider when building a home. One of the interesting features of a log home, is that when you heat the logs they radiate warmth back into the room which increases energy efficiency. In warmer climates this works in reverse: when the sun is beating down on the exterior of the home it doesn’t transfer that heat to the interior. This means a cooler temperature in the summer and warmer in the winter. On top of a mountain, hidden in a bush, perched by a lake, or even in a suburb, log homes look amazing no matter where you build one. They have a knack for standing out while blending in. Log homes remain timeless, their style doesn’t change with mainstream trends. For example, how old do you think this Cabot I model home is? Present Day. Hint: It’s 33 years old! This conventional home was also built 33 years ago. 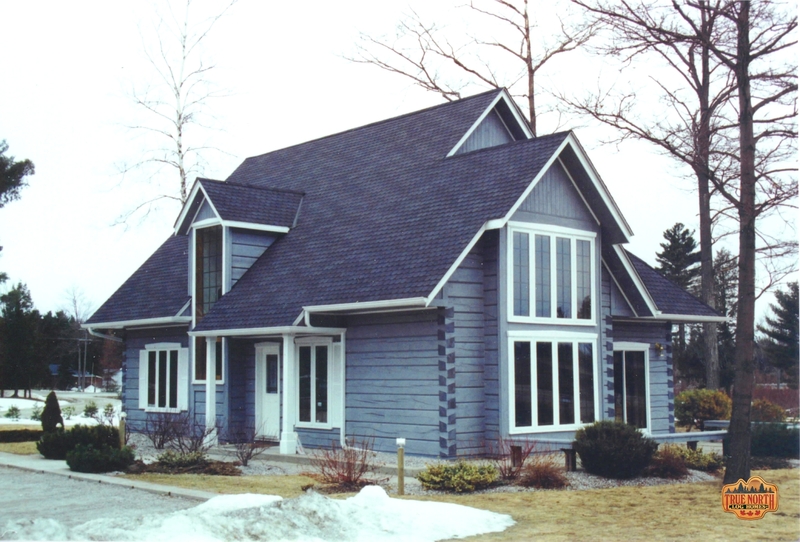 Our Cabot I model has had some upgrades over the years (exterior colour change, timber truss accents) but the style is unchanged. 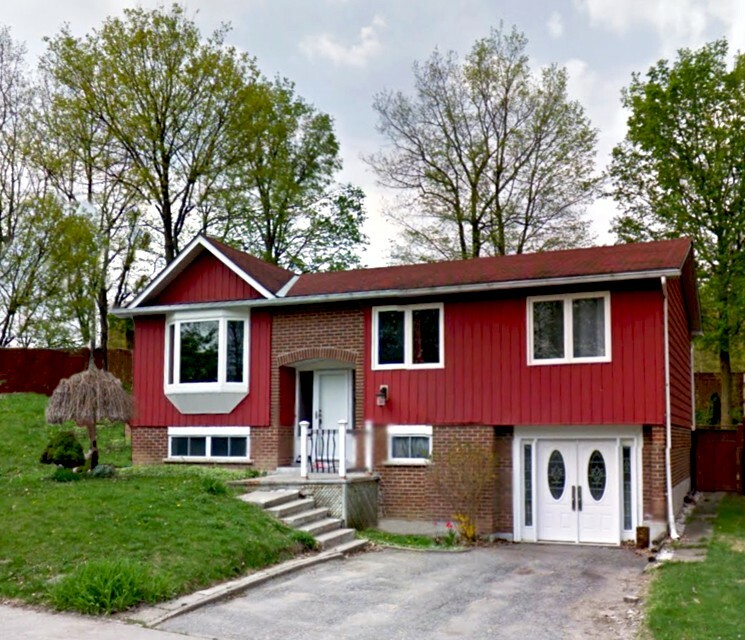 In comparison, the conventional home also built in the 1980s has also had some upgrades on the exterior (siding, newer doors and windows, converted garage to second entry, landscaping) but the style and brick still date the home. That’s right, a True North log home has no more maintenance then a conventional home. Don’t believe us? 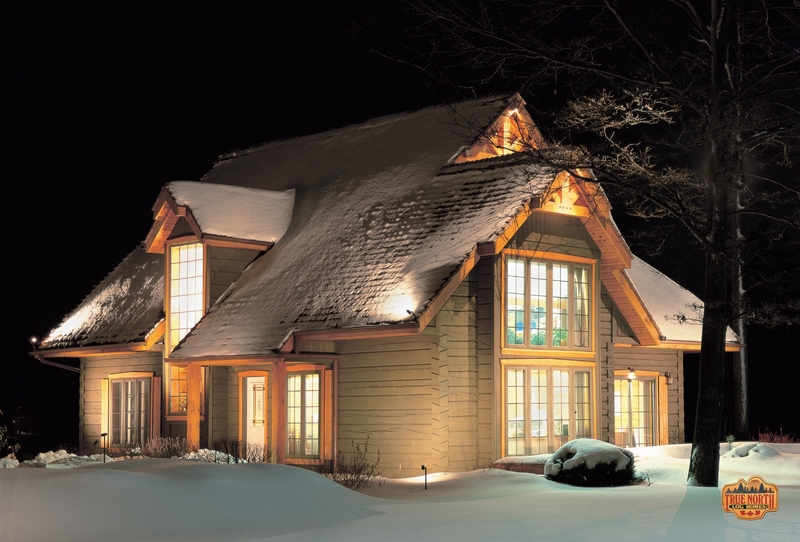 Learn more about our advanced technology and how we build our log homes. Everyone looks for something a little different in a log home, but the reason to build a log home is often the same. A True North log home stands the test of time. Solid wood walls can last far longer than conventional homes and can withstand more of Mother Nature’s fury than conventional building methods. The technology exclusively available through True North Log Homes is state-of-the-art and solves the issues traditionally associated with building and maintaining a log home.